Probe Reports from the NIH Molecular Libraries Program [Internet]. Bethesda (MD): National Center for Biotechnology Information (US); 2010-. David B. Sykes, Mark K. Haynes, Anna Waller, Matthew Garcia, Oleg Ursu, Kristine E. Gouveia, Larry Sklar, Timothy A. Lewis, Sivaraman Dandapani, Benito Munoz, David T. Scadden, Michelle Palmer, and Stuart L. Schreiber. David B. Sykes,1 Mark K. Haynes,2 Anna Waller,2 Matthew Garcia,2 Oleg Ursu,2 Kristine E. Gouveia,2 Larry Sklar,2 Timothy A. Lewis,3,* Sivaraman Dandapani,3 Benito Munoz,3 David T. Scadden,1 Michelle Palmer,3 and Stuart L. Schreiber3. Received: December 15, 2013; Last Update: February 11, 2015. Acute Myeloid Leukemia (AML) in adults is a clinically devastating disease with a 5-year survival rate of only 25%. We lack new and effective therapies for AML, and the chemotherapy standard of care remains unchanged in thirty years. One success story has been the discovery of drugs that trigger the differentiation of leukemic blasts in a small subset of patients, approximately 10%, with acute pro-myelocytic leukemia. Differentiation therapy is not available for the remaining 90% of acute myeloid leukemia patients. We generated a novel cell line model of acute myeloid leukemia, based on the potent ability of the homeobox protein HoxA9 to block differentiation in primary murine cultures of immature myeloblasts. These cells were engineered with a built-in reporter of differentiation, permitting a high-throughput flow-cytometry-based phenotypic differentiation screen against more than 330,000 small molecules. 2,500 compounds were retested resulting in twenty-nine confirmed hits. Active compounds and analogs were obtained, validated, and tested in dose against the screening cell line as well as other murine and human cell lines. This identified twelve active compounds from which two distinct scaffolds were chosen for further study based upon chemical tractability and availability. One of the two hits demonstrated stereospecificity, hence we chose to explore SAR about this lead. 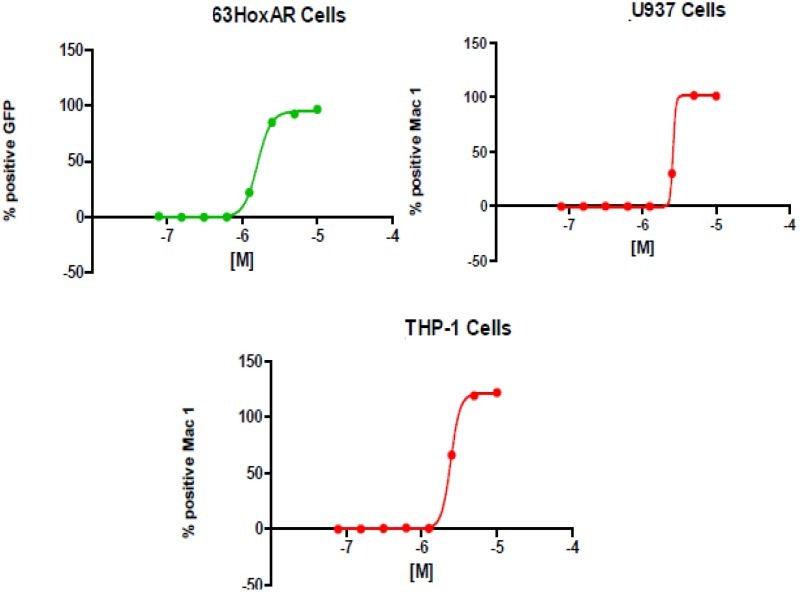 Of approximately thirty synthesized analogs, we identified four compounds that were more active in three cell lines (THP-1, U937 and ERHOXA9). We have chosen compound ML390 as the probe given its potent activity. Of note, the lead compound and its analog ML390 are both very well-tolerated with limited cytotoxicity at high concentrations when assayed against cultures of normal human primary bone marrow cells. ML390 exerts its potent differentiation effect on multiple leukemia models, though its mechanism of action is currently unknown. Target identification assays as well as experiments for testing the compound in vivo are currently underway. Mechanism of action studies will be performed in parallel using a combination of gene expression studies (Library of Integrated Network-Based Cellular Signatures, LINCS), stable isotope labeling by amino acids in cell culture (SILAC), and next-generation sequencing of compound-resistant cell clones. ML390 will be tested in mice harboring a HoxA9-driven acute myeloid leukemia to assess its differentiation effect as well as its effect on leukemic progression and overall survival. The chemotherapy standard of care in acute myeloid leukemia relies on traditional cytotoxic chemotherapy and has not changed in more than thirty years. We need new, and less toxic, therapeutic agents. In the context of our novel cell line model of AML, we hope to have identified a clinically relevant pro-differentiation therapy for acute myeloid leukemia. If successful, we anticipate that ML390 will offer insight into the mechanism of overcoming differentiation arrest, and will translate into a starting point for a much-needed new and potent treatment for patients with acute myeloid leukemia. The expression of the homeobox transcription factor HoxA9 is normally downregulated as cells mature. The persistent high-level expression of the HoxA cluster of genes, and in particular HoxA9, is found in the majority of cases of acute myeloid leukemia (AML). One promising treatment paradigm has been the identification of small molecules that trigger the differentiation of the leukemic AML cells; however, differentiation therapy is currently not available. Our probe, ML390, was identified from a high-throughput screen in which cells - blocked in differentiation by HoxA9 - were incubated with a library of small molecules to identify those that could trigger differentiation. The cells were engineered with a built-in marker of differentiation to facilitate the high-througput flow cytometry-based screen. ML390 triggers myeloid differentiation in murine and human cell line models of acute myeloid leukemia but does not affect the myeloid differentiation of normal human bone marrow cells. ML390 will be useful as a probe for leukemia researchers as well as researchers studying myeloid development and homeobox transcription factor biology. A conditional version of HoxA9 was generated by fusing it with the hormone binding domain of the estrogen receptor such that HoxA9 is only active in the presence of estrogen. The same system has been described for a number of other oncoproteins, including HoxB8 and E2a/Pbx1 (1, 2). When introduced into primary murine bone marrow mononuclear cells by retroviral transduction, and cultured in the presence of stem cell factor (SCF) and beta-estradiol, the ERHoxA9 protein arrests myeloid differentiation, causing the outgrowth of myeloblast cell lines. These cell lines proliferate indefinitely in the presence of beta-estradiol and SCF. Removal of beta-estradiol from the culture media inactivates ERHoxA9 and the cells are freed from the HoxA9-differentiation arrest and undergo normal myeloid differentiation. The system was further adapted by generating cell lines using bone marrow harvested from transgenic mice in which green fluorescent protein (GFP) is inserted downstream of the endogenous lysozyme promoter (3). Lysozyme is a secondary granule protein, only expressed in differentiated myeloid cells. Thus, the ERHoxA9 myeloblast cell lines derived from the bone marrow of the LysozymeGFP transgenic mice were GFP negative in the presence of beta-estradiol but became brightly GFP-positive upon removal of beta-estradiol and inactivation of ERHoxA9. Procedure: Cells were cultured in RPMI (Cellgro) supplemented with 10% fetal bovine serum (Serum Source Int'l), penicillin/streptomycin, L-glutamine (Omega Scientific), 5% conditioned media containing stem cell factor (SCF), and 0.5 μM beta-estradiol (Sigma). On day 1, 25 μL of complete media supplemented with 0.04% Pluronic F-68 (GIBCO) was added to a sterile 384 well culture plate (Greiner) followed by the addition of 0.2 μL of test compound in DMSO (Sigma). Wells contained complete media supplemented with Pluronic F-68 and the 5 μM of the estrogen receptor antagonist fulvestrant that served as a positive control for differentiation. 25 μL of cells (1.2×105/ml) in complete media were added and the plates were incubated (37 °C/5% CO2) for 4 d. Final concentrations of components were 3000 cells/well, 4 μM test compound, and 0.4% DMSO. On day 5, plates were harvested as follows - 5 μL of an antibody/bead solution consisting of a 1:100 dilution of APC-conjugated anti-mouse CD11b (eBioscience, cloneM1/70) and a 1/500 dilution of polystyrene beads (Spherotech) were added to wells and the plates were incubated for 20 min prior to sampling using the HyperCyt® high throughput flow cytometry platform. Procedure: Cells were cultured in RPMI (Cellgro) supplemented with 10% fetal bovine serum (Serum Source Int'l), penicillin/streptomycin, L-glutamine (Omega Scientific), 5% conditioned media containing stem cell factor (SCF), and 0.5 μM beta-estradiol (Sigma, E2758). On day 1, 25 μL of complete media supplemented with 0.04% Pluronic F-68 (GIBCO) was added to a sterile 384 well culture plate (Greiner) followed by the addition of 0.2 μL of compound dilution arrays in DMSO. Some wells contained complete media supplemented with Pluronic F-68 and 5 μM of the estrogen receptor antagonist fulvestrant that served as a positive control for differentiation. 25 μL of cells (1.2×105/ml) in complete media were added and the plates were incubated (37 °C/5% CO2) for 4 d. Final concentrations of components were 3000 cells/well and 0.4% DMSO. Test compounds were serially diluted 1:3 six times starting at 40 μM, resulting in a concentration range of 40 μM to 6 nM. The resultant data points were fitted by Prism® software (GraphPad Software Inc., San Diego, CA) using nonlinear least-squares regression in a sigmoidal dose-response model with variable slope, also known as the 4-parameter logistic equation. Curve fit statistics were used to determine the concentration of test compound that resulted in 50% of the maximal effect (EC50), the confidence interval of the EC50 estimate, the Hill slope, and the correlation coefficient. On day 5, plates were harvested as follows - 5 μL of an antibody/bead solution consisting of a 1:100 dilution of APC-conjugated anti-mouse CD11b (eBioscience, cloneM1/70) and a 1/500 dilution of polystyrene beads (Spherotech) were added and the plates were incubated for 20 min prior to sampling using the HyperCyt® high throughput flow cytometry platform. Cell viability and green fluorescence was stable for 24 h after the day 4 incubation. Gating on the inert bead population provided a measure of sampling quality, as the same number of beads are seeded into each well. The percent of GFP and APC positive live cells was used to determine whether the test compound has a differentiating effect. Procedure: Fluorescent compounds were identified and discarded by assaying for green or red fluorescence. Murine cells immortalized by HoxA9/Meis1, and lacking the GFP-reporter, were cultured in the same fashion as described above for the cells in the primary screen using RPMI (Cellgro) supplemented with 10% fetal bovine serum (Serum Source Int'l), penicillin/streptomycin, L-glutamine (Omega Scientific). On day 1, 25 μL of complete media supplemented with 0.04% Pluronic F-68 (GIBCO) was added to sterile 384 well culture plate (Greiner) followed by the addition of 0.2 μL of test compound in DMSO. 25 μL of cells (1.2×105/ml) in complete media were added and the plates were incubated (37 °C/5% CO2) for 24 h. Final concentrations of components were 3000 cells/well, 4 μM test compound, and 0.4% DMSO. After 24 h incubation plates were harvested using the HyperCyt® platform and cells of interest were gated using forward and side light scatter. Green fluorescence was excited at 488 nm and detected with a 575/25 optical band pass filter. Red fluorescence was excited at 635 nm and detected with a 665/20 optical band pass filter. Wells that were scored as fluorescent in either emission channel were flagged as auto-fluorescent, either a result of the compound's intrinsic fluorescence, or the ability of the cell to metabolize a non-fluorescent compound into a fluorescent compound. Procedure: Data for MAC1 expression was extracted from the primary screen data set. Procedure: Promega CellTiter-Glo(R) Assay was utilized to measure ATP (as a surrogate for viability) in the fibroblast cell line NIH 3T3 as a measure of cellular viability. Opaque-walled multiwell plates with mammalian cells in culture medium, 100 μL per well for 96-well plates or 25 mL per well for 384-well plates were prepared. After background luminescence was obtained, the test compounds were added and incubated according to culture protocol. After 30 min, a volume of CellTiter-Glo(R) Reagent equal to the volume of cell culture medium present in each well, the contents were mixed 2 min on an orbital shaker, incubated for 10 min before recording luminescence for 200 msec. Procedure: Same as primary assay except using wild-type HoxA9 (i.e. the constitutively active HoxA9 protein lacking the estrogen-receptor fusion) cell line and on day 4, a MAC1-APC antibody was added. Cell lines: THP-1 and U937 human leukemic cell lines. Procedure: Same as primary assay except using human leukemic cell lines. These are factor-independent cell lines and estrogen-independent cell lines, such that cells were grown simply in RPMI supplemented with 10% fetal bovine serum. Procedure: The assay uses HEK293T, HepG2 and A549 cells obtained from ATCC to test for cytotoxicity at a range of concentrations (0.05-26 μM). Compounds are added to cells and incubated for 72 h. Cellular ATP levels are measured as a surrogate for cell viability using the luminescence reagent, CellTiter-Glo (Promega). Procedure: Same protocol as primary assay except using primary CD34+ cells. Cells were isolated using magnetic bead positive selection (Stem Cell Technologies) from the discarded bone marrow filters from normal human bone marrow donors. In this case, the cells were cultured in RPMI supplemented with 10% fetal bovine serum, 50 μM beta-mercaptoethanol, as well as 10ng/ml stem cell factor, interlukin-3, interlukin-6, thrombopoeitin, and flt-3-ligand. The solubility of the probe (ML390) was experimentally determined to be 2.5 μM in phosphate buffered saline (PBS, pH 7.4, 23 °C) solution. Plasma protein binding (PPB) was determined to be 99% bound in both human and mouse plasma. The probe is stable in human plasma, with approximately 100% remaining after a 5-hour incubation period. The compound was found to be stable in glutathione (GSH) with 99% remaining after 48 hours. Other probe properties can be found in Table 1. Summary of Probe Properties Computed from Structure. The stability of probe ML390 in PBS (0.1% DMSO) was measured and the probe is stable as approximately 100% was present after 24 hours of incubation (Figure 1). Stability of the Probe (ML390) in PBS Buffer (pH 7.4, 23 °C). Commercially available (R)-1-amino 1,2,3,4-tetrahydronaphthalene was coupled to tBOC-protected β-alanine. After acid deprotection, the free amine was reacted with the substituted benzoyl chloride to give the desired product. The synthesized compounds in this report were all made using this route. ML390 (SID 164348244, CID 71768304) is a new compound, not found in either SciFinder or PubChem. The SAR of our compound library is based upon cellular testing. The values for the probe represent the average of three experiments per cell line, the highest error value (SD) was 17% among the three assays. Once we have identified potential enzymatic target(s) responsible for the observed cellular activity, analogs will be tested to ensure that inactivity in cells was not an artifact of poor PK properties. Ideally there will be general correlation between in vitro results of suspected targets and the cellular activities observed. Approximately thirty compounds from the active series were tested for toxicity against HeLa, HepG2, and HEK293 cells. No cytotoxicity was observed up to 26 μM concentration with HeLa and HepG2 cells. ML390 and its analogs showed some cytotoxicity in the HEK293 cells with EC50s in the 4-17 μM range. This assay will be repeated and if confirmed we will look to determine if these embryonic cells are related in some way to our cell lines. No profiling assays were carried out. The probe and analogs have been deposited to the general screening collection at the Broad Institute. Investigation into relevant prior art entailed searching the following databases: SciFinder, PubChem, PubMed, US Patent and Trademark Office (USPTO) European Patent Office, and World Intellectual Property Organization (WIPO) databases. Abstracts were obtained for all references returned and were analyzed for relevance to the current project. The searches were initially performed on April 13, 2011 and were updated on November 24, 2013. The initial verified lead compound (CID 16307489, BRD-A35207501-001-01-9) was reported in PubChem; bioassays reports it to be active in ten out of 350 assays, hence it is not promiscuous and we expect the probe will behave similarly. Among the targets where activity was detected are urokinase-type plasminogen activator, protein Mdm4 isoform 1, breast cancer type 1 susceptibility protein, respiratory syncytial virus (RSV), malarial parasite plastid, VEEV, and TC-83. To the best of our knowledge there are no other active small molecules in our target cells. Sykes DB, Haynes MK, Waller A, et al. Discovering Small Molecules that Overcome Differentiation Arrest in Acute Myeloid Leukemia. 2013 Dec 15 [Updated 2015 Feb 11]. In: Probe Reports from the NIH Molecular Libraries Program [Internet]. Bethesda (MD): National Center for Biotechnology Information (US); 2010-. Lewis TA, Sykes DB, Law JM, Muñoz B, Rustiguel JK, Nonato MC, Scadden DT, Schreiber SL. ACS Med Chem Lett. 2016 Dec 8; 7(12):1112-1117. Epub 2016 Sep 28. Sykes DB, Kfoury YS, Mercier FE, Wawer MJ, Law JM, Haynes MK, Lewis TA, Schajnovitz A, Jain E, Lee D, et al. Cell. 2016 Sep 22; 167(1):171-186.e15. Epub 2016 Sep 15. Angiocidin induces differentiation of acute myeloid leukemia cells. Tuszynski GP, Rothman VL. Exp Mol Pathol. 2013 Dec; 95(3):249-54. Epub 2013 Sep 13.
Review Current and emerging therapies for acute myeloid leukemia. Robak T, Wierzbowska A. Clin Ther. 2009; 31 Pt 2:2349-70.
Review Histamine H<sub>2</sub> Receptor in Blood Cells: A Suitable Target for the Treatment of Acute Myeloid Leukemia. Monczor F, Copsel S, Fernandez N, Davio C, Shayo C. Handb Exp Pharmacol. 2017; 241:141-160.